The 41A2827 is a replacement chain drive gear and sprocket kit. This gear and sprocket kit is compatible with various chain drive garage door openers manufactured since 1984. 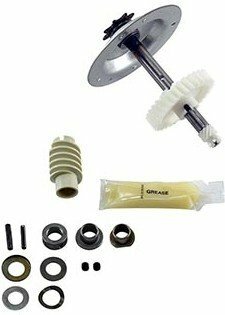 This complete kit includes these items: Helical gear, worm gear, wear bushings, grease, and hardware needed to replace the chain drive gears. This kit also includes a new sprocket cover. * 41A2827 is a replacement part and must match to your owners manual to be compatible with your opener.